Ahead of its August 12 PC release. “What lies at the center?” asks the launch trailer for Hello Games’ hugely-anticipated open world space exploration game No Man’s Sky. In just three days time, assuming you’re playing on PC, you can begin to find out for yourself. For a while there, it seemed as though PC players might get the chance to explore the procedurally-generated galaxies of one of the most hyped games in videogame history earlier than planned. Steam was at one stage counting down to today, however Hello’s head honcho Sean Murray later clarified on Twitter this wasn’t the case, and that Friday marks the worldwide launch on PC. Since then, we’ve learned the game’s massive day one patch increases galaxy sizes—which already comprised more planets than we could ever conceivably visit in our lifetimes—and fixes exploits; that creator Murray worries NMS "maybe isn’t the game you imagined”; and that we probably won’t be able to download it until well into the 12th—and not Thursday midnight as first hoped. Our review will unfortunately be slightly delayed too—for reasons you can read about over here. 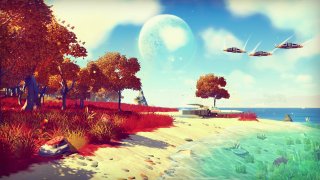 No Man’s Sky is due to launch this Friday, August 12.